Maggie used cloth on her daughters. And her daughters used it on their children. There was no other option then. Today we have choices. Many new mothers are chosing cloth for their babies, but the array of choices can be intimidating. Flats, prefolds, snappies, pockets, all-in-ones, all-in-twos, microfiber, cotton, organic, hemp, bamboo, PUL, wool… whew! I knew nothing of all this when my oldest was born. I knew that there were cloth diapers and plastic covers but that was about it. Our family has used cloth diapers for over three years now and I love it. It’s economical and comfortable. Over time I’ve found what I like and what I don’t and what works and what doesn’t. Here are some tips and tricks that I hope will be helpful to you. Though it’s hard to imagine, wool covers can be waterproof, breathable, cool and inexpensive. None of those adjectives came to mind when I first started considering wool diaper covers. Now they are one of my favorite options – especially for overnight. When lanolized wool is becomes water resistant which is what makes wool covers waterproof. Because they are a natural fiber wool is breathable. Wool can be very soft, cool and comfy. And if you make your own pull-on covers (called “soakers”) out of old wool sweaters from the thrift store, then they are super cheap too. If you use wool covers you know the ins and outs of lanolizing. If you need a touch up it’s nice to have a liquid lanolizing spray. You can buy lanolin touch-up sprays from most cloth diaper stores or you can make your own. It’s quite easy. Very convenient too. I put this in a 2 oz. travel size spray bottle this summer when we were traveling for 3 weeks and it kept my wool cover nice and fresh. Boil water. Measure out 1 oz. of water in a 1 cup pyrex measuring cup. Add a dash of Eucalan Wool Wash (this will keep the lanolin from clumping and dissolving evenly) . Stir. Disolve 1/2 tsp. lanolin in the boiling water and Eucalan mixture. Pour in your spray bottle. Fill to the top with water. Shake before each use. Ta da! You’re done. Spray away. Diaper Spray: This combination is good to clean and soothe a messy bottom. Combine 1 tbl. of olive oil (or jojoba oil) two drops of tea tree oil, two drops of lavender oil. Put in a 2 oz. spray bottle and fill with witch hazel. Use with cloth wipes. Diaper Rash: If you are struggling with diaper rash in the early days from lots of poopy diapers that are acidy, then add a little bit of baking soda to the diaper spray recipe above. Laundry: Now a word about washing diapers. There have been many times in the last 2.5 years of trying to figure out a good wash routine where I have envied Maggie. When she needed to wash she went to the well on her back porch, drew out the amount of water that she needed, likely heated it and then hand washed her dirty laundry. Now, I’m don’t intend to argue that using a washing maching is more difficult than hand washing. However, I would bet that there have been days that I’ve spent more hours trying to get my diapers clean than Maggie did. Laundry Soap: You can find my recipe for laundry soap that is cloth diaper safe and great for HE or top loading washing machines by visiting the Wash Porch. Cloth Diaper Wash Routine for a public HE machine: (Used with a Whirlpool Duet front loader) Warm soak, Normal warm wash with no spin, Quick spin (to get the dirty water out), Heavy Duty hot wash with homemade detergent (above) and medium spin speed with extra rinse. And FINALLY they are clean! 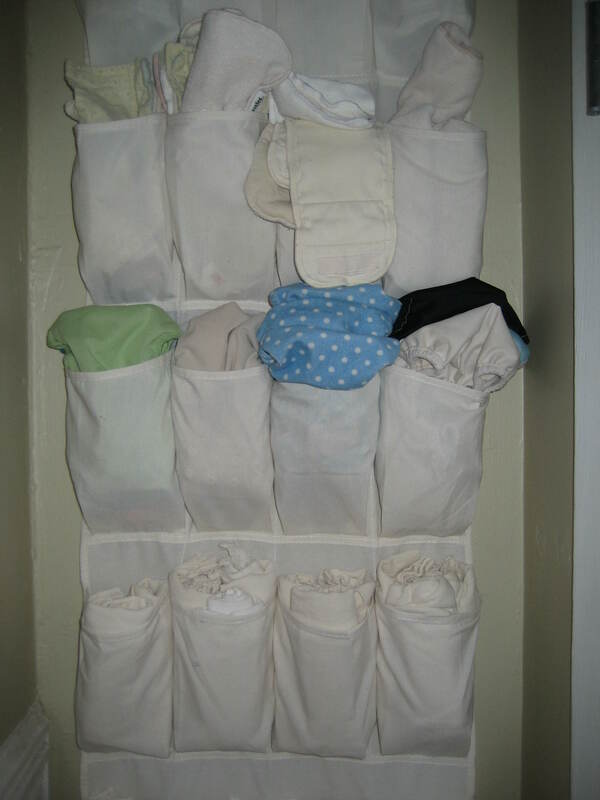 I came up with this fun storage for my cloth diapers while spring cleaning this week. Canvas show organizer turned diaper holder. The thing that I find the most difficult about traveling with cloth diapers is getting all of the dirty ones in my diaper pail at home washed before we leave the house for two weeks. That’s why I save disposables for the day before we leave so that I’m not making a new load of diaper laundry that I’m not going to get washed. When we fly, we don’t check bags. So, everything that goes in must be essential and well thought out. Here’s a packing list of the essentials when you are travelling with cloth. 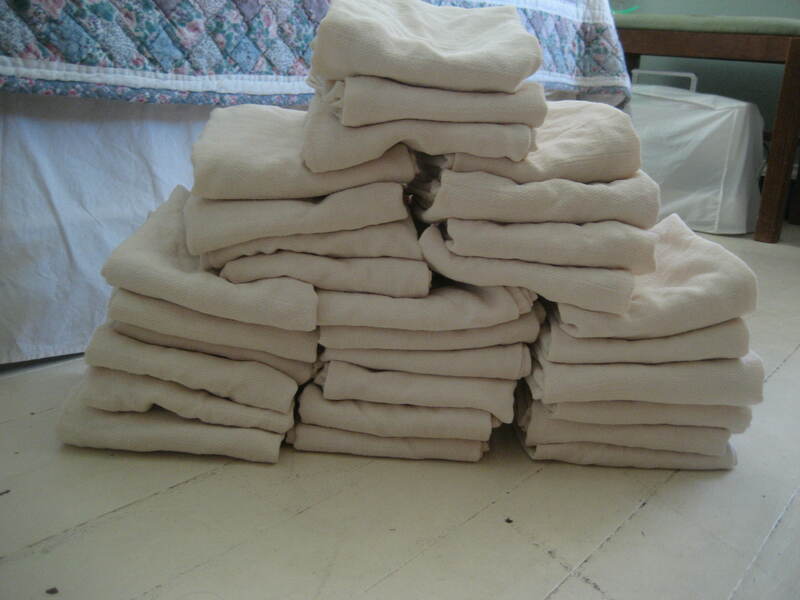 18 flat diapers – I find that this gives me enough for one baby for about three days. 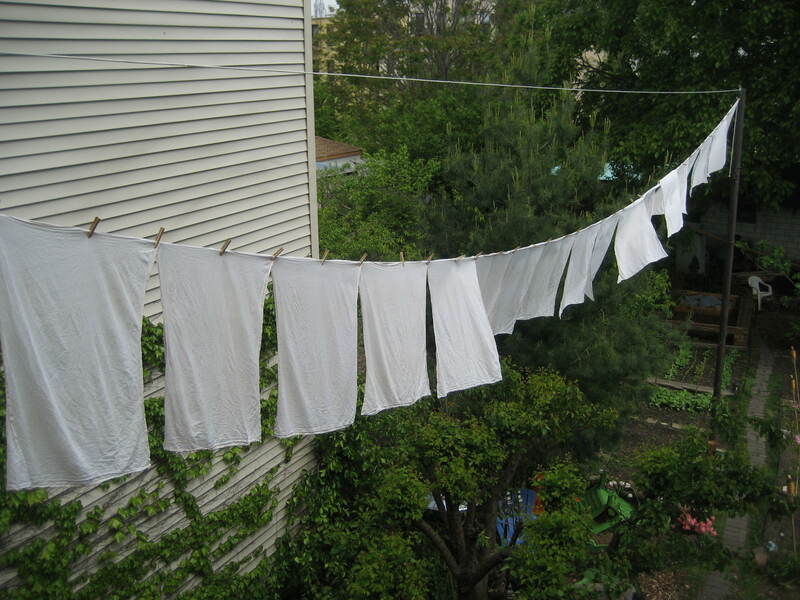 If you have a newborn or two in diapers you might find yourself washing every other day. Flats are great for travel as they wash up easily only being one layer and dry fast if you are limited to hand washing and drip-drying in a hotel room. They can easily be doubled for extra overnight absorbency, and if you have a little one and big one using diapers everyone can wear the same thing. 3 PUL covers – Pick your favorite go to covers. I usually hand wash as soon as I an finished with the cover or as soon as it gets soiled and hang to dry over the shower curtain rod. Note: If you’re travelling with your cloth diapers, throw in your mama cloth too. You know it’s more comfortable and you can just wash with the diapers that you’re going to was anyway. You can definitely travel with your cloth. Why add $20-30 more to the cost of your trip? Travelling is expensive enough as it is. A package of disposables takes up about the same amount of room as 18 flats. Why not travel with something that you can reuse? Do you have any tips for travelling with cloth? Comment below.